The 2017 Planner Is Available Now! 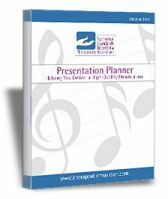 The 2017 Presentation Planner provides resources for planning effective presentations and includes updated references to current research, frequently with hyperlinks to abstracts and full articles. You will get more than 30 pages full of information and resources to build your therapeutic practice through effective presentations. We accept Visa, MasterCard, Discover, American Express and PayPal. If you have questions or concerns please contact us. When you click submit you will be directed to Paypal to make payment based on the total listed above. After payment is complete you will receive a link to download the NSBTM Presentation Planner.